Have you noticed how many new staple pieces have been coming out this season? Everything from Kourtney Kardashian's x Pretty Little Thing collab to the infamous Gucci belt. 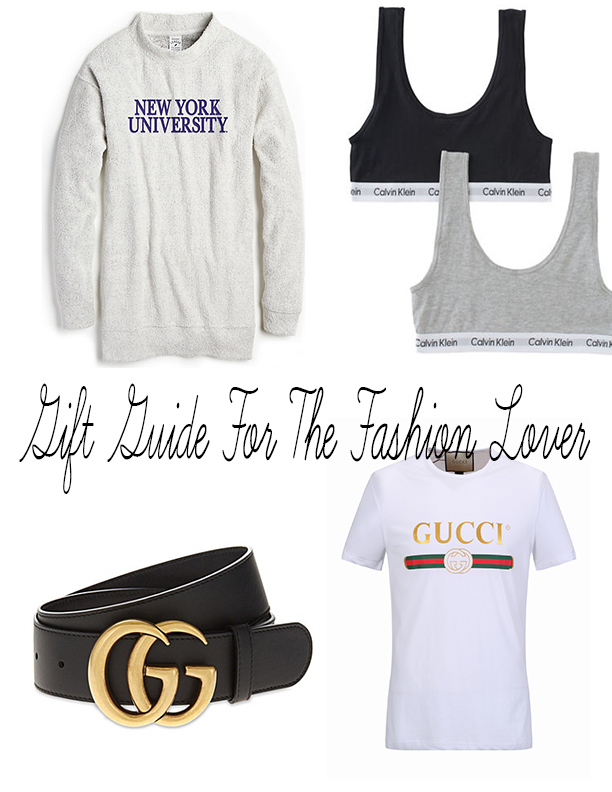 I'm not sure if these things were planned or if they just all happen to be hitting the market, but I know some of these pieces would be an excellent Christmas gift for the fashion lover in your life. One. Slip Ons // I have this on my Christmas Wishlist too, but these shoes have become so wildly popular these past couple months, I just had to include them on here too. Especially since there are so many different shades and styles. These shoes range from $25 at Target to $75 at Steve Madden. It really just depends on your budget and what style you're looking for. Two. Crew Neck Sweaters // Is it just more, or is it now that I'm older I prefer crew neck sweaters over hoodies and long sleeve shirts over t-shirts. I know that a lot of my friends find crew neck sweaters so comfy and I totally agree! One of my favorite things to do is get a comfy crew neck from different universities, like my University of Scranton one. Even if their not name brand and they just have a special meaning behind it, a crew neck sweater is perfect for the chilly winter nights. Three. Statement Belts // I know you all have seen the Gucci belt that has become a staple piece in every blogger and Youtuber's closet. As much as I don't want to admit it though, I secretly want one. The Gucci one is definitely popular, but even other brands like Michael Kors have these staple belts that just make a plain outfit look so good! Four. Gucci T-shirt // While we're talking about Gucci, this Gucci t-shirt has come out of nowhere. Even if it's not Gucci, there are other brands like Tommy Hilfiger that have these t-shirts that just work for any event. Hanging out with friends, going out to lunch, running errands, football games.... you can literally wear it anywhere! Five. Levi Jeans // Levi's have been around for the longest time and in my life I've only had two pairs. Always from a yard sale, but still the best fitting jeans I have ever worn. As usual, Urban Outfitters makes vintage stuff chic again and now they have Levi in their stores. Just find someones pant size and get them the freshest pair of jeans on the market. Six. Calvin Klein // Pretty much anything and everything Calvin Klein is a great piece to add to someones closet. Their under and bra sets are extremely comfortable and super trendy. You can also find Calvin Klein pieces at Marshalls, TJ Maxx, and Ross! We found some great sweat pants, sweaters, and even dresses if you look hard enough! These are some fashion staples that I think any fashion lover in your life would love. I know I would (hint, hint, wink, wink!). Anything else you think I should add to this list? Let me know by commenting down below.